As art lovers, artists and their creations begin to parachute into Hong Kong for Art Basel, the city is in for a treat with the arrival of Louis Vuitton’s Objets Nomades collection, on display from 23 to 31 March exclusively at the former Central Magistracy. Ever-expanding in nature, this special collection remains anchored in celebrating the objets as much as the talent behind them. In an homage to the House’s timeless style and intuitive savoire-faire, the visionary objects in this year’s edition come from global design masters and rising standouts alike. To mark the occasion, award-winning design duo Raw Edges will preview their latest Objet Nomade—a gorgeous, jaw-dropping, playfully patterned chair—in Hong Kong before revealing it to the international press at Fuorisalone in Milan in April. The Objet perfectly marries the duo’s fixation with collapsible items with a sense of Louis Vuitton avant-garde through its bright colours, striking shape, and customisability. New Objets from Atelier Oï are also not to be missed. Pairing the Swedish trio’s knack for modernity and discipline with the history and artisanship of Louis Vuitton, the possibilities become endless as seen in the Serpentine Table, their latest addition to the collection. 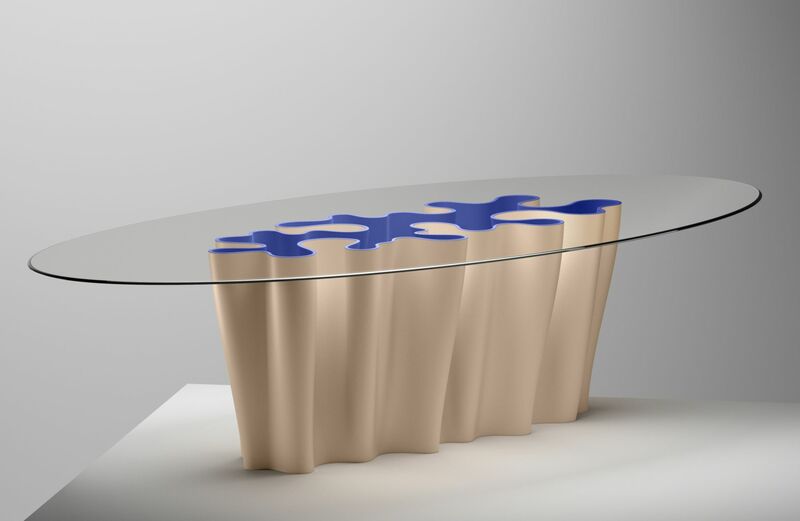 Conceived through a delicate balance of weight and tension, the table is also an object of contrasts with criss-crossed American walnut legs held tight by blue Louis Vuitton leather under a beveled glass top. It’s clear the trio’s visit to the House’s workshops in Asniéres was nothing short of inspirational. Joining the collection for the first time, Atelier Biagetti melds its obsessions with human behaviour and sensuality with the House’s identity in travel and transport to create an object from an almost entirely different dimension: the Anemona Table. While being a domestic object around which people can gather (up to 12 people can be accommodated at the Anemona Table), the table’s undulating shape is wholly other-worldly, inspired by the duo’s own proximity to both the Adriatic Sea and the mysterious nature of the sea’s depth and creatures. The full Louis Vuitton Objets Nomades collection will be displayed in a scenography created specially by the internationally acclaimed Joyce Wang Studio, best known for their immersive, cinematic interiors. This year’s display will not disappoint as visitors will walk into a grand, arching avant-garde home full of portals and sensory stimulus meant to inspire and serve the imagination. Visitors will be reminded of the House’s affinity for craftsmanship, creativity and surprise through this year’s new Louis Vuitton Objets Nomades from the world’s most innovative and respected creative masters.